Most couples prefer to choose separate wedding bands, however the trend of matching wedding ring sets for him and her has grown over the years as new styles and trends have emerged. Think about it. You and your loved one have matching hearts; you complete each other, why not symbolize that with matching wedding rings? It’s a fantastic way to show your union. Many matching wedding ring sets for him and her involve designs that are only complete when the two rings are displayed adjacent to each other. For example, some rings feature half a heart on his band and the other half on her band, so that when the rings are put together, their complementary designs form one large heart. This way, the rings serve as a metaphor for the loving couple: beautiful on their own, but more stunning when together. Every couple has a style, and when choosing matching wedding ring sets, the trick is to find a set that encapsulates both his and her swagger. The Professional Couple – He wears a suit everyday, she rocks heels on the regular. Both hard working professionals, in the midst of their careers, climbing the ladder towards success each and every day. This couple needs matching rings that exhibit a sense of romance combined with professionalism. Nothing too gaudy or over the top, but something sleek, simple, with a diamond to top it all off. Brilliance.com’s Matching Bezel Heart Concave Wedding Ring Set is the perfect his and her pairing for the professional couple. The Artsy Couple – She’s an actress trying to make it big and he’s a musician, writing love songs about her all day long. A more artsy couple needs a ring set that goes beyond the traditional norms. Perhaps something with mixed metals or different colored gemstones. Because of their artistic background, they are not afraid to step out of the comfort zone of traditional wedding band styles, and therefore are attracted to the more creative designs. 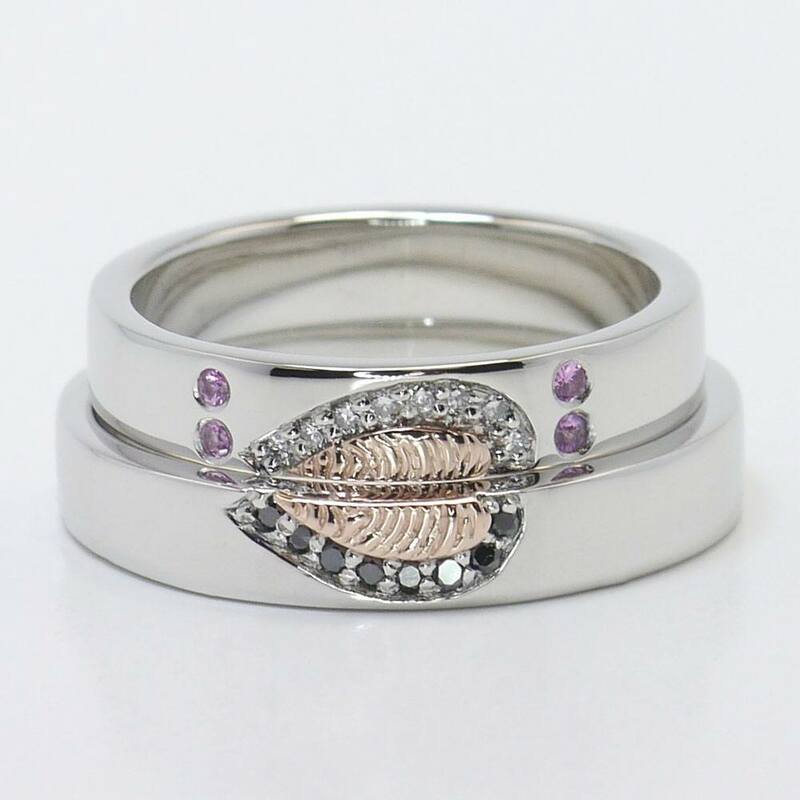 For instance, this His and Hers Fingerprint Wedding Band Set features purple sapphires and diamonds on her ring and black sapphires on his ring. When put together, the design creates a heart-shaped fingerprint. It’s very unique, and very artistic. The High School Sweethearts – This couple has known each other for a very long time. They knew each other when they were still in that awkward teenage phase, and their love has grown over time. This couple seeks a set of wedding rings that are timeless. This Matching Split Heart Diamond Wedding Ring Set in both yellow gold and white gold is exactly what they are looking for. Because of its traditional use of a heart, and the diamonds, it is a style that will last forever, just like their love. The Hipster Couple – They wear matching flannel shirts, so they needs matching rings that reflect their edgy, laid-back style. A hipster type couple doesn’t want anything over the top, they would rather focus on what the ring represents. Simplistic styles with a bit of twist like this Matching Heart Fingerprint Inlay Wedding Ring Set are exactly what they are looking for. These rings are simple white gold wedding bands with a yellow gold inlay fingerprint on the top. When put together, the yellow gold finger print creates a heart. It’s a clean, basic look with a bit of a twist. No matter what kind of couple you two are, or if you don’t feel you fit a type at all, there are surely wedding ring sets out there that will appropriately symbolize your love for one another.